UPDATE: The male pit bull was 3 or 4 years old and was raised by the family since it was a puppy, Diaz said. Its sibling and mother, both pit bulls, also are kept by the family. An 8-month-old girl was killed in a dog attack Wednesday in Miramar, police said. The attack was reported at a home in the 2400 block of Kingston Drive. "She was the best thing to ever happen to me," the baby's mother, Brenda Villasin, said. "We smiled every morning. She was my world." Miramar police confirmed that the infant was killed by HER FAMILY'S PIT BULL while she was in the care of her grandmother. The baby was sitting on a bouncy chair in a bedroom when she was killed, authorities said. "This child is only 8 months old," Officer Yessenia Diaz said. "It is very difficult for the entire department and our heartfelt sympathy goes out to the entire familySky 10 was above the scene at 12:30 p.m. as authorities had the home blocked off with crime scene tape. Animal control vans were parked outside the home. A woman was seen speaking with detectives officers. Miramar police said the pit bull that attacked Liana is between 3 to 4 years old. It was removed from the home by the Broward County Animal Care and Adoption Division, as well as two other dogs at the home, police said. Villasin said she drops her daughter off at the grandmother's home every day so she can go to work, but never did she think anything like this would ever happen. "Nobody wakes up in the morning and thinks they are going to lose the person they love," Villasin said. Villasin said she was still at work when police called her. "When you get a call like that, you don't ask questions -- you just go. I left work right away," she said. This death was 100% preventable. Children and pit bulls do not mix, although the pit bull lobby would have you believe pit bulls are nanny dogs. The price of owning a pit bull is too high. Who wants to sacrifice their child's life just to prove pit bulls are great pets? This pit bull proved us haters right again. 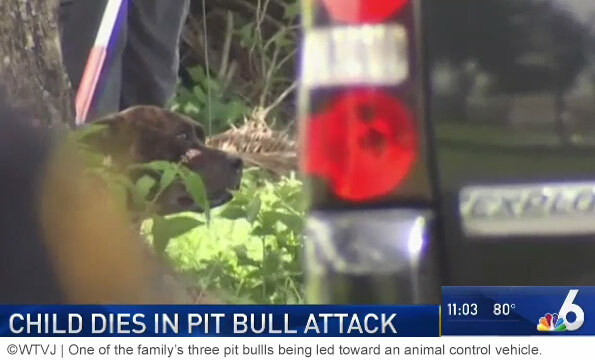 Pit bulls are dangerous, lethal, and deserve their reputation. That poor baby. As a mother myself, yes my child is the best thing to ever happen to me. How are these attacks not the subject of national interest and outrage? The attacks on children are the worst to me. I do not see how anyone can continue to spout off about "dog racism" anymore. This is not an accidental death. It is the predictable outcome of leaving a large vicious animal near a small human.